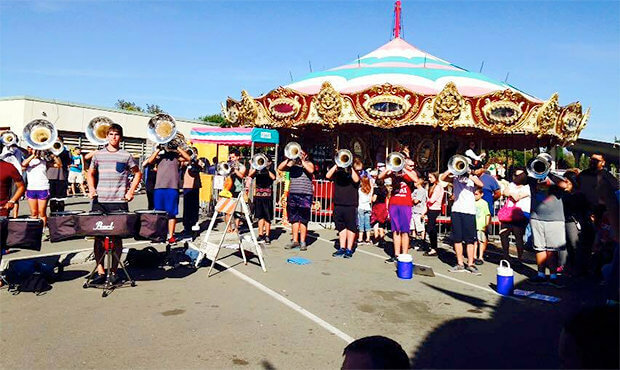 Members of Blue Devils B took time out of their rehearsal schedule last weekend to perform at the annual Concord High School Carnival. Check out these pics from the event. Blue Knights members were on set this week shooting a commercial for a local Denver business. Blue Stars are seeking volunteer drivers for the corps’ upcoming summer tour. Auditions are coming up for the Bluecoats-sponsored drum line that performs at all Cleveland Browns football games during the NFL season. Youth Education in the Arts’ annual Wine, Beer and Food Fest, which supports the Cadets, is coming up on Sunday, May 3, in East Rutherford, New Jersey. Check out these photos of the Carolina Crown drum line from the group’s rehearsal camp last weekend in South Carolina. Crossmen announced that the corps’ 2015 competitive production will be called “Above & Beyond.” The show will feature works by Eric Whitacre and Wynton Marsalis, among others. The Madison Scouts cymbal line was caught on video during a recent rehearsal camp. Mandarins will celebrate the grand re-opening of its Bingo center in Sacramento on Saturday, May 16. A copy of the Pacific Crest organization’s 2014 annual report is now available to read online. Racine Scouts introduced several new members of the corps’ instructional staff. The latest episode of “SCV: Backstage” follows the organization’s World Champion color guard during the WGI Sport of the Arts World Championship in Dayton, Ohio. Check out this set of photos from Spirit of Atlanta’s April rehearsal camp.